The one curious nature with us Keralites is that we seldom let go something/someone we love. It takes a lot of effort for a person to become a leader of mass in Kerala unlike the situation across our state border, and once he does, he stays. Precisely why our filmi star Mohanlal hasn't been vacuumed out of the malayalee hearts despite his best efforts to exit the stage, unceremoniously. The adjectives attributed to this actor by the pundits and public will envy any rival. Versatile, flamboyant, flexible, realistic...oh, I may need one full giga-byte to type them all here. In a nut-shell Mohanlal has been the one outstanding star among the glittering array of actors who've done Kerala proud...a true jewel. Let me take the privilege of paying tribute to the actor who have had a two-way influence on my life. First as an adolescent film-mad boy who could brush aside any important works to watch him bedazzle on silverscreen; and lately as a more mature film-lover who purposefully avoided any contact with his new movies for prolonged periods of time just because I couldn't stick the deluge of crap anymore. Mohanlal, who broke into the league as an anti-hero in 1980 conquered the Kerala hearts through his covetable exhibition of characters. From a rookie comedy man & romantic hero in his best-pal Priyadarshan's well-translated remakes to humourous one-from-your-neighbourhood man in Satyan Anthikkad movies, through the evergreen and charismatic Padmarajan flicks, thrilling the senses with trend-setter and career-changing characters like Vincent Gomez and SAJ and those realistic roles in the straight-from-life Lohitadas-Sibi Malayil tales, Lal chose to take the long hard route into people's ventricles. He was a dream actor for all directors and carried a guarantee tag for the producers and distributors. He has given his fans and public much and more to cherish.. The 3 National Awards or half a dozen state awards mean nothing more to common Keralite than the illustrious and unforgettable roles he portrayed. 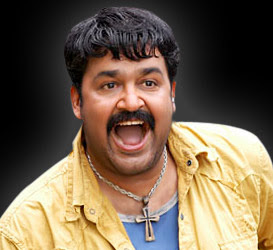 I'm not sure where exactly the long slide down commenced for Mohanlal. But I'd bet my bottom dollars on his emergence as an above-the-almighty super-hero. This, one mustn't confuse with his old classic action-hero movies like Irupatham Noottandu (1987) & Rajavinte Makan (1986), somehow elevated the actor's image from a one-from-among-you man to an out-of-your-reach-hero. Films like Aaram Thampuran (1997)and Narasimham (2000), though commercially successful (and critically bull-shitted) triggered an unforeseen crisis for the Superstar from which he is still struggling to come out, even as you read. Ustaad (1999), Ravanaprabhu (2001) and co didn't impress me much, neither did the following disastrous flicks like Praja, Onnaman (2002) and the likes. Seeing him and his movies degrade to standards of a third-rate axn film was so painful that I vowed never to watch another Lal movie after torturing myself with Praja (2001) on a near empty theater on New Years eve. Lal never give me an opportunity to break my oath for long 3 years until Roshan Andrews came up with Udayananu Thaaram (2005). Every film star will go through lean patches, but for Lal the bad stretch seemed eternal. One after another he cast himself in utterly ridiculous movies and one after another they bombed at the box-office; each louder than the previous one. This is a list Lal will never be proud of, neither will be the vast majority of Lal fans in the Universe, starting 1999. This archive from 1999-2009 features his major commercial releases which flopped. In the last decade Lal has given the audience not a single character which they'll remember 20 years from now, apart from Udayabhanu (Udayananu tharam, 2005), Mullamkolli Velayudhan (Naran, 2005) and Rameshan Nair (Thanmathra, 2005). Just 3-4 roles worth remembering in a Jupiter year clearly tells a story, a far cry from the Lal of the late 80s or the 90s who gave us unforgettables like TP Balagopalan, Soloman (Namukku Parkkan Munthirithoppukal), Jayakrishnan (Thoovanathumbikal), Ramadas (Nadodikkattu), CP (Vellanakalude Naadu), Sethumadhavan (Kireedam), Nettooran (Lalsalaam), Kalliyoor Gopinathan (Bharatham), Joji (Kilukkam), Mangalassery Neelakandan (only in Devasuram) and many many many more. Whatever happened to the Lal who made us laugh, cry and think in all the dream roles an actor could get? His appearance on the screen was hardly inspirational, the roles totally misfitting and it appeared to me that Lal was getting uncomfortable with his own self. Many a times, his mannerisms and body language portrayed an individual who seemed to be trying too hard for an image makeover. For convenience, lets point the finger at those script-writers and directors who shelled out screenplays not worth a dime for Lal. Movies like Onnaman and HariharanPillai (2003) is doomed even if it was Tom Cruise leading the show. Even bewildering was it to see that these movies were created by directors like Joshi, Sibi Malayil, K.Madhu et al who'd created a name and fame for themselves. If you don't believe me, look at the list of Directors who shelled out loads of crap with Lal, it becomes clear that it is not one person at fault. The one lesson Lal missed was that clinging on to the high standards he had set for himself was no easy job. It was eventually his responsibility to make sure that characters like Alibhai, Hariharan Pillai and Captain Kumaran was never born from him. I agree cent-percent with blogger and film-critic BVN and his observation that Lal has completed transformation from the Asset side of Malayalam Cinema to Liability side with his 2008 disaster Red Chillies. What a shocker of a movie! Here is an example of a man who didn't care anymore.. Didn't care about his reputation, didn't care about the industry, didn't care about his fans like you or me... People even concluded that Lal cared only for the Green bucks, and his commitment to the industry and fans no longer existed. Is it so difficult to see through a screenplay (like Red Chillies) that this would be a colossal waste of 16 reels of film? Even Kunjakko Boban would've returned that poppycock script to Shaji Kailas.. But again Lal took it on his head because of his apparent inability to say "no" to close pals. And see where it has brought him. But again, the rare streaks of light still trickle from those dark and deep clouds, evidenced by his latest release- Director Blessy's Bhramaram. The film, set on a framework similar to the duo' s previous hit Thanmathra (2005), exhibited to the world how the Carbon could come out as graphite or diamond if treated properly. It is also a testimonial to the barren intellectual state of our film industry which spreads rust into even the immaculate of metals. So Lal, you're still pristine! Keralites will still forgive you for the torment you meted out to us in recent years because you're still capable of such occasional brilliance. What worries us is that this ray of light has become a bit too far between. Personally speaking, I'd like to see one Lal movie an year if it is a Bhramaram, or even like Madambi or Twenty-Twenty, instead of half a dozen Alibhais and Red Chillies. Isn't it about time you handpicked what you want to do Laletta? Or are we destined to watch more red-faced appearances on the screen from you? I hope not, for goodness sake.